In 4-quart Dutch oven, cook beef over medium-high heat 5 to 7 minutes, stirring occasionally, until thoroughly cooked; drain. Stir in hot water, sauce mix and uncooked pasta (from Hamburger Helper box), salsa, milk, chili powder and beans. Heat to boiling, stirring frequently. Reduce heat; cover and simmer about 10 minutes, stirring occasionally, until pasta is tender. Remove from heat; stir. Sprinkle each serving with 2 tablespoons cheese and tomato. Not a “hot” fan? 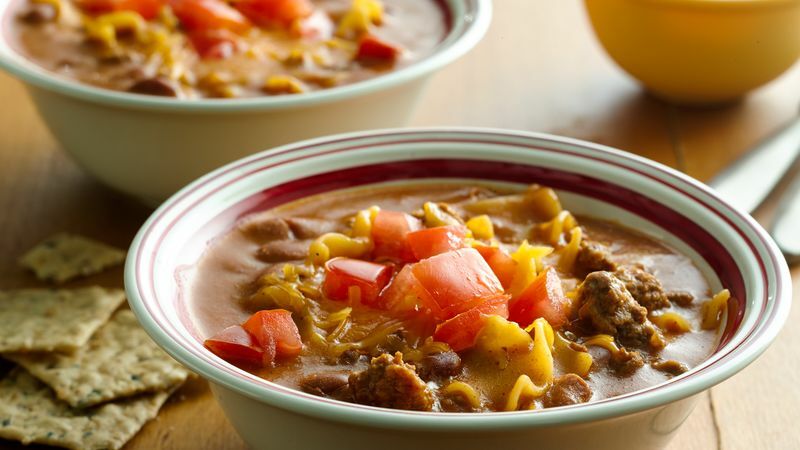 Use mild salsa, and replace the spicy chili beans with kidney beans. To really spice things up, use a hot variety of salsa or stir in canned Old El Paso® chopped green chiles with the salsa.